Don't Scrap that old parts car yet! A brand new Mustang convertible body shell, for many enthusiasts, may be the fastest way to get your restoration project out of the garage and back on the road. If you've ever restored a classic car or other vintage Ford Mustang, you know how much work, parts and "massaging" it takes to get the final product to look good, fit right and not show a mass of ripples along the sides without 100 hours of block sanding. The 1964 1/2,1965 and 1966 production means there still are a lot of unrestored convertibles out there, but a quick look on Craigslist or Ebay and you see sellers getting top dollar for the very few restorable whole cars and worse, a lot of money for rollers that once were considered only suitable as parts cars. So what can you do if your "must haves" include a Mustang convertible body, you have a reasonable budget, but maybe not the time or the skills to cut and replace rotted quarter panels, complete frame repairs and floor pan rust-outs? Do the math. These brand new body shells are dead straight, professionally welded together, with no cowl leaks or rust and the doors and rear deck lid (trunk) are already mounted. That's a lot of time and effort saved and one mechanically decent but rotted out donor car can provide the rest of the "bones" to complete the picture. They still need a new hood and front end sheet metal, but most likely, the donor car does too. So add another $350 bucks for new front fenders, $40 for new front valance and maybe, $175 bucks for a new steel hood and you have, for all intents and purposes a complete new Mustang convertible body from front to back. 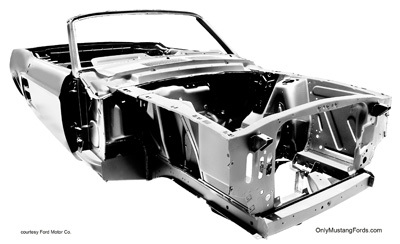 So what's the cost for one of these brand new Mustang convertible body assemblies? A relative bargain starting at $15,995. And they will deliver them right to your door. In a number of ways these reproduction body shells are better than an original. Obviously, they are brand new, so there is absolutely no corrosion or dirt. And the bodies have been treated to modern rust proofing that will keep them rust free for decades. Unlike your donor car, these body panels and frame supports are already primed and ready for paint. That also saves a lot of time and money at the body shop or in your own paint booth. No miles means no creaks or groans, particularly important when convertibles are notoriously less stiff than their coupe and fastback cousins. Further ensuring a strong stiff body, Ford's licensing partner Dynacorn, has used slightly thicker steel for the body panel stampings, as well as adding special reinforcements in areas known for flex. Plus modern welding processes ensure stronger joints in these new Mustang convertible bodies. Two main models are available now. 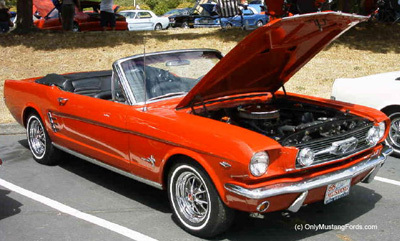 A 1967 or a 1965 Mustang convertible body. That being said, the 1965 can be made into anything from a 1964 1/2, 1965 or 1966 car with changes only to the trim, while the 1967 body can become either a '67 or a '68 vintage car. This setup is also a great choice for either a restomod or a track car, and saves a nice unmolested car from the cutting torch. That would certainly speed things up this winter in the garage. After all, wouldn't you rather be driving than restoring anyway?